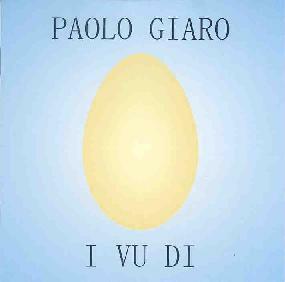 Paolo Giaro - "I Vu Di"
Italy's Paolo Giara is certainly a composer of talent. His music merges a number of styles, from new age, to classical, to world music, to folk. On I Vu Di, his third album, Giara plays acoustic, classical, 12-string, and Indian guitars, as well as contributing vocals, whistle, keyboards, loops, and something called a moka. Other players flesh out the sound with sax, bass, grand piano, and soundscapes. The 12 compositions on the CD encompass a variety of approaches. Fading Story is almost pure classical, with its piano and strings setting a mood of tranquility. Alture has touches of spaciness, and a clunky but intriguing rhythmic structure. Occhi Ridenti (Laughing Eyes) has a lullaby-like sound, with vocals, and sounds of a laughing child. For me, this piece was a little on the sweet side, and probably the weakest track on the album. I Vu Di is more of a world beat piece, with vocals, and a somewhat interesting rhythm. Sea Spirits is easily the best track on the album, with its spacey Floydian textures, moody slide guitar, and odd dissonant notes to keep things interesting. It's a shame that the rest of the album couldn't have been like this. Ventanas is carried by a slow, tribal-like rhythm for its first half, and then moves along into Pat Metheny territory. Unfortunately, it kind of wears thin before it's over. Aurora is more music in the Pat Metheny vein, with some very mellow acoustic guitar that meanders along for a little too long (almost 10 minutes). The piece does have some nice atmospherics in its second half, but also some irritating vocals that distract from the mood. Tango Jungle is more or less just a brief rhythm experiment with an orchestral melody. In contrast to the longer pieces on the album, I would have liked to have heard more on this one (it's only a few seconds over 1 minute in length). The last piece on the album, Fuori Di Queste Mura (Outside These Walls) is what I might imagine hearing in an Italian coffee house, if there's such a thing. It's basically a folk ballad, with lyrics in Italian. So, what are we left with? I, personally, was left wishing the entire album had been built in and around the themes and ideas in Sea Spirits. It could have made for a spaced out masterpiece, which this is not. Not that it tries to be either. This is predominately new age, but has the added bonus of stronger compositions than are usually heard in that genre, and a lot of acoustic instruments, rather than a wishy-washy mess of synthetic sounds. If that sounds like something you'd like, you may want to check it out. For more information you can visit the Vel Net web site at http://www.vel-net.com.